Classic manga (1975), with shoujo-style artwork of the period. The heroine is beloved by a demon and finds that horrid things happen to anyone who gets emotionally close to her. Quite a good story. There was a short anime OVA inspired by the manga. The heroine gets herself in an embarrassing situation, mainly the fault of her promiscuous sister. As result she is open to blackmail by the son of the local factory and apartment block owner, who has recently returned to the area. As the boy used to be a nasty little bully, the omens are not good. Full of teen angst and tense emotional situations – this is a popular series. Twin girls with quite different personalities have magical powers of telepathy and teleportation. A well-known old shoujo manga – also a TV anime. Rather dumb plot-lines. Azumanga Daioh by Kiyohiko Azuma (ADV Manga). The original 4- frame gag manga series, from which the popular TV anime was adapted. Featuring some schoolgirls, variously sporty, smart, or hyper-active, or just dim, all attending the same school, and their dysfunctional teachers. Excellent characterisations, and very funny. If it doesn’t make you laugh, seek professional help! The classic (1991) shoujo manga. Actually may be an acquired taste – the artwork is nice and it’s quite good describing characters, but, with its wonky future settings, to me gives a strong impression of having been written by a schoolgirl. This seems to be an American pseudo-manga. The heroine, though not dead, finds herself in the afterlife addending some sort of college. She’s a camera buff. This has nice artwork and is very funny; one of the best and most accessible of this batch of manga. Small girl moves to Hokkaido with her dad, who wants to become a specialist baker. An alien spacecraft which was carrying some captured nasties crashes nearby, and Tsubasa gets involved with the pilot who is trying to round up the escaped creatures. 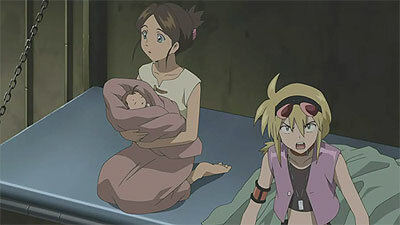 One of his alien tools accidentally clones Tsubasa into an identical girl/weapon, who enters Tsubasa’a life as Hikaru. This is a striking mixture of a detailed account of rural life, mixed with sci-fi. There is also an anime, equally unusual in that it was made for TV with 50-minute episodes. Worth checking out. Fantasy novel, about thief and conman Locke. 1 of 3 vols. I liked this; it has interesting characters and has many totally unpredictable plot twists. Vol 1 of a series- this features three entirely different characters, a barbarian fighter, a conceited nobleman and oficer, and a crippled torturer, tells their stories and brings them together. Clearly a set-up for further joint adventures in the following volumes, this is exciting, has interesting characters and is often wryly funny. Set in a fantasy world with medaeval types fighting each other, this failed to arouse my interest in any way, and I couldn’t be bothered to finish it. A miss. The Bone Doll’s Twin by Lynn Flewwlling. Book 1 of a trilogy. In a world of magic, a murderous king has usurped a tradition of rule by warrior-queens. Wizards try to protect a royal princess from the fate of other female royals by disguising her as a boy – and stifling her twin brother at birth. The disguising part works, but otherwise things go rather wrong. Sometimes unflinching and with vivid characterisations, sometimes earthy, this is totally absorbing. Recommended. In the world of Japanese animation “Blue” seems to be a code-word denoting something to do with the ocean, and so it is with this anime, in which a major disaster, the “Hammer of Eden” or oceanic surge, has caused a huge temporary inundation and billions of human deaths. The survivors are struggling to reconstruct, but are fundamentally divided. The submariner Gould, captain of a double-hulled submarine attack vessel, wishes to impose an efficient dictatorial rule, while the (female) Secretary-general of the UN wishes to restore a democratic tradition. Amidst all this, the boy Ked lives on an island on top of which a UN naval aircraft carrier is stranded. Ked has a twin brother, whom he hates, who serves in one of the navies. Ked is acquainted with Isla, a young woman a little older than him, who is pregnant. In the action-packed first episode, Gould attacks the UN forces on the island, much of the town is destroyed, Ked’s brother turns up, and Isla gives birth. I’ve seen the first two episodes and skimmed the third so far. This anime is quite a lot of fun, and unlike some anime, in which several episodes can pass without the plot going anywhere, things seem to go at a brisk pace in “Tideline Blue”. It’s far from deadly serious. There are plenty of humorous moments. For instance, in episode three, the expression on the ostrich’s face when it thinks it is going to be eaten is laugh-out loud funny. Not an outstanding anime, but worth checking out if this sketch makes it seem interesting. 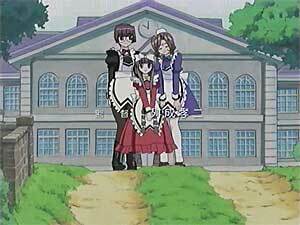 Kokoro is the youngest of three sisters who run the Kokoro Library founded by their father. The library is big enough to serve a city, but is situated in remote coutryside, and consequently is rarely visited. On Kokoro’s first day at the front desk, there is just one visitor, a young woman who borrows a book that she read as a child. A week later nobody at all turns up on the day appoined for this book’s return. Upset, Kokoro checks the address and goes to the city to retrieve the book. I watched only the first episode. The scenario is unconvincing, and the characters, the designs, and storyline didn’t do anything for me. Not recommended. 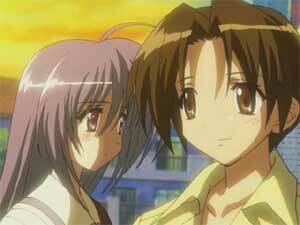 A six – episode OVA series – a school story with a mystery, set against the background of an unexplained war. Asaba is an ordinary high -school boy who lives with his parents and younger sister. During the school holidays, he sneaks into the school swimming pool building for a quiet swim, and is surprised to find a girl swimming there. She gets into difficulties and has to be rescued. They are disturbed by an intruder and when Asaba leaves he is shocked to find a whole security detachment outside, waiting for the girl. When the term starts, Asaba has another shock when the girl enrols in his class. She acknowledges Asaba but is rather distant with the other students. Asaba is a member of the Newspaper Club (actually just two people at this point in the story) which has been trying to investigate activity at the nearby Sonohara air base. When they learn that the girl, Iriya, has some connection with the base, the club president pressurises Asaba (who needs little persuasion) to date Iriya and so find out more about the base. As the series progresses we find out more about Iriya, and a state of military emergency is declared. 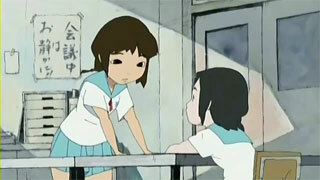 In places “Iriya no Sora” is very funny, and in others sad and touching, and occasionally just unconvincing. So worth watching? In summary it’s no masterpiece but worth a look. The ‘Attack no 1’ drama is based, somewhat loosely, on the classic shoujo sports-anime of the same name. The original ran to 104 episodes so, even with 11 x 50 min episodes, the drama is somewhat shorter. The story re-uses elements from the anime in what, one has to say, is something of a mish-mash, and adds some significant new plot elements. It would be tedious to compare and contrast all the changes, but if you have seen the original (better known in Europe as “Mila Superstar”) you could figure them all out for yourself. Enough to say that in the drama, Kozue Ayuhara (girl in red shorts at far left of pic) is a senior high school student at Fujimi High, and a member of the volleyball team. She isn’t the captain or the most highly regarded player so there is shock when she is called to the National training camp instead of her friend Midori, by the notoriously severe coach Inokuma. Here she finds herself pitted against a number of skilled and experienced players, and Inokuma, for reasons of his own, makes her acting Captain, a role for which everybody including Kozue feels she is unfitted! However Kozue wins over the players, including the unpleasant but gorgeous Sanjo, who turns out to be .. but lets not disclose that spoiler. Kozue soon falls foul of Inokuma’s ruthless tactics, and there are several more anime-style plot twists before the end. In the last episode, the National team plays in an international tournament. The original anime Attack no 1 was essentially a straight drama, even if the action occasionally seemed a but implausible, and rather than depicting volleyball realistically, it aimed more to be about the psychology of playing competitive sport. (The anime Attacker You contains more realistic animated volleyball.) The drama is constrained to show real girls knocking real balls about, but off-court, which is most of the time, has an anime-like plot which if anything is more over-the-top than the original… It certainly has quite a light feel and one is left with the impression that one isn’t meant to take this drama entirely seriously. Whether one has seen the original or not, this drama is great fun to watch, and a knowledge of the sport is not required. Comparison with the “other” sports-drama derived from a classic anime is inevitable, and while both are worth watching, some think that “Aim for the Ace” is the better of the two. This 9- episode drama series is adapted from the “Ace o Nerae” anime/manga. I have the first 4 episodes of the original 1st TV series on tape, and having re-watched it yesterday I found that almost all the major incidents of the early episodes of the anime have been re-used in the drama in some form or other. I have reviewed the anime at: Ace anime. In adapting it the production team have kept the essence of the story much the same while completely changing the look and feel. The anime is quite comic and has a rather psychedelic colour palette, while the drama is a perhaps typical straight live-action drama. Hiromi’s character is essentially unchanged (though she seems more air-headed in the first episodes of the anime) – she remains a rather cute thin little girl with above-average determination. For those who don’t know the story, Hiromi is drawn to the Nishi School tennis club purely by hero-worship of the school princess Ryuzaki Reiko (“Ochofujin”), who is rich, beautiful, self-assured and a skilled player. As a beginner, Hiromi is truly awful, but her determination catches the eye of the stern new tennis coach Munataka. As part of his plan to develop Hiromi, to general outrage, he makes her no.5 in the inter-school tennis team in place of the apparently much more skilled and experienced Otowa Kyouko. Bullied and unhappy, Hiromi tries to resign, but the coach is unrelenting. Before long there are signs that the coach was right. The tennis match sequences are well-shot – perhaps some skilful editing was necessary here! The story works well as a drama. In case you were wondering, some care has been taken to avoid sexing it up – there is a lot more leg visible in the anime! It’s tempting to compare this with the “other” sports-anime derived drama “Attack no 1”. “Aim for the Ace” scores high because it works really well as a drama, and because it is fairly faithful to the anime. By the way, two of the actresses appear in both. It’s still there; you need to locate the link to it (e.g. below or in Blogroll). This blog replaces the splash page. is standing nearby. Did he have something to do with Nao’s gentle descent? Soon, the girls discover the secret world of “Wind Users”. 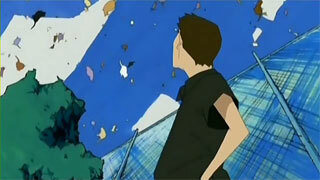 The artwork is in a fairly distinctive style, and the episode stories generally involve either daily life or the wind. There’s one episode devoted to a game called “Kick the Can”, and another in which Nao’s father secretly learns to ride a motorcycle. The girls are well characterised – they seem just like real schoolgirls. I found the whole series altogether charming.